Postage and production costs continue to rise each and every month, and The Remnant is in desperate need of some help from its friends and allies around the world. If you enjoy the daily updates and loads of free content here on our website, would you consider donating to our tax-exempt Foundation? We need help to keep this apostolate going and to keep this website free. Your donation is tax exempt. Why is The Remnant worthy of your generous support? The Remnant is an apostolate. The services provided on our website are for the most part free of charge, and the subscription rates for our print edition--which comes out every two weeks--are kept very low. The Remnant is all about the Faith and Catholic restoration. It's first and foremost an apostolate, not a business. The Remnant is a family-run operation. With an exceedingly low overhead and a staff made up primarily of dedicated members of the Matt family, including the eldest of my seven children, every penny donated to this apostolate goes right back into the fight for Catholic restoration. The Remnant is active in social media. The Remnant has a highly successful Facebook outreach, and offers daily updates to tens of thousands of visitors who do not subscribe to The Remnant newspaper. This takes time and commitment. Remnant TV The Remnant has recently branched out into Internet TV. With weekly episodes, The Remnant is fast becoming the premier traditional Catholic television resource on the Internet. Check out Remnant TV here. This costs us money but we charge nothing for it. We need your help to keep Remnant TV going, which is now bringing the traditional Catholic cause to a whole new demographic. A long track record of not backing down. 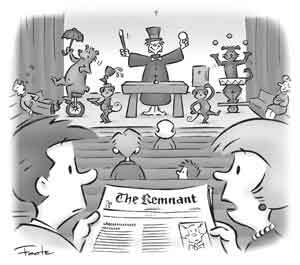 For nearly 50 years The Remnant newspaper has been at the forefront of defending the traditional Catholic teaching, laboring for the restoration of the Traditional Latin Mass, and loudly proclaiming the social Kingship of Christ in a world at war against Him. Catholic Action. It's not just a lot of hot air. This year The Remnant again organized the US Chapter on the Pilgrimage to Chartres in France, for example, and sponsored nearly 20 young Americans to make the 3-day, 2-night pilgrimage of tradition. This pilgrimage is changing lives all over the world, and The Remnant has been organizing it for 24 years. Now on five continents. The Remnant is available in dozens of countries and to priests all over the world, as well as curial cardinals in the Vatican and Latin Mass centers in the US, Canada and Europe. It is being translated into Spanish and we hope to soon begin offering a French edition. We're absolutely committed to the Catholic counterrevolution. We're hard at it every single day, in fact, and The Remnant's success indicators are not hard to find. All we need is a little help from our friends. The liberal Catholic press is bankrolled by foundations and wealthy special interest groups. We, on the other hand, rely totally on subscription revenue and private donations. With your help we will continue to fight in defense of Tradition and Christ the King! Please consider giving a donation of any size to The Remnant Foundation. "Honey, maybe we'd better help these guys out!"